July 7, 2016 – Whitman Publishing announces the upcoming release of volume 7 of the Whitman Encyclopedia of Obsolete Paper Money, by Q. David Bowers. In 736 pages this volume covers the early bank currency of the Southern states of Alabama, Arkansas, Kentucky, Louisiana, Mississippi, Tennessee, and Texas. The book was published on June 28, 2016. 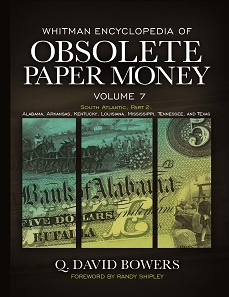 Q. David Bowers,Whitman, Encyclopedia of Obsolete Paper Money Volume 7: South Atlantic, Part 2: Alabama, Arkansas, Kentucky, Louisiana, Mississippi, Tennessee, and Texas. Whitman Publishing, Atlanta (GE), 2016. Hardcover, 8.5 x 11 inches, 736 pages, full color. ISBN: 0794843964. US$ 69.95. The Whitman Encyclopedia of Obsolete Paper Money is a multiple-volume study of currency issued from 1782 to 1866, before the modern era of National Banks and the Federal Reserve. Over the course of these decades more than 3,000 state-chartered banks issued their own paper money, which facilitated much of the nation’s day-to-day commerce. In volume 7 Bowers, a well-known historian and past president of the American Numismatic Association, gives the history of 182 towns and cities in the states covered, as well as of the nearly 500 bank in those towns that issued this uniquely American currency. Each note is studied, and thousands are pictured in full color, with information on grading, rarity, values, significant auction results, advice for collectors, and more. Active collectors, researchers, dealers, historians, and other experts have volunteered their time and knowledge to help create this new encyclopedia series. The state editors for the Southern states of Alabama, Arkansas, Kentucky, Louisiana, Mississippi, Tennessee, and Texas included noted specialists and researchers Rodney Kelley, Tony Swicer, Randy K. Haynie, Justin McClure, Gary Burhop, and Mike Marotta. Earlier volumes of the Whitman Encyclopedia of Obsolete Paper Money include an overview of the field, and detailed coverage of the New England states of Connecticut, Maine, New Hampshire, Massachusetts, Rhode Island, and Vermont, as well as the Southern states of Florida, Georgia, North Carolina, and South Carolina. Future volumes will cover the rest of the South Atlantic states, the Mid-Atlantic states, the American Midwest, the District of Columbia, and territories. Collectors, dealers, historians, and hobbyists interested in assisting on future volumes may contact Whitman Publishing. More information on the book is available on the Whitman website.